rikshaw design: did you notice? And, i am so glad i did..she has taken all my feedback and changed things a million times for me..and even better we are now "friends" we love music and bearded boys..birds of a feather, i tell ya! ok..so back to my blog..
besides the over-all look and clean-up, i have added a link to listen to Rikshaw's tunes!...so if you are a fan of some of the music i blog about..click on to the link and you can hear what i listen to over at our very own pandora station..
i also wanted to thank all of you for taking the time to stop by and read, and even better leavin me a comment..when you ask a question i try and go back and answer it in the comments of that post..so check back, so glad we are all friends...its so nice for me to have this little place to share with you a bit of me..
congrats! looks SO good--great job! looks gorgeous, very Rikshaw Design!! love the new layout! have a happy day! i LOVE it...wish i could listen to Pandora here, it's blocked- BOO! 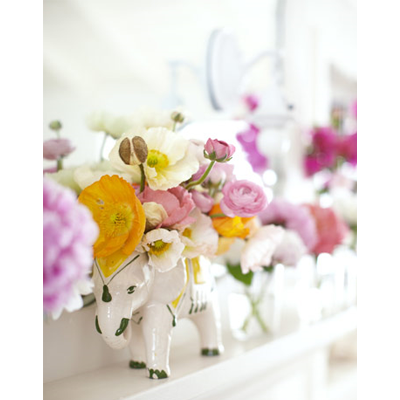 and i love the photo in this post- the elephant, the ranunculus...perfection. congrats Catherine! it's seriously stunning!!!! I dig the new look!! It looks great! looks so great, I love the new layout! Very chic, and I love the cute profile pic! One functionality note: you can't actually click on your blog header to take you to the main blog....you can only click on a post title. Not sure if people actually read that way, but I just noticed it and thought I'd let you know! Love the new look - and truly love your new picture. The whole blog just looks happy, happy, happy!!! Love it! Jess is brilliant, isn't she? my blog is in the works..it's almost done and i can't wait.